Home Catalogue Archive by category "Obidome and Obi-Kazari"
Erstwilder is a small Australian company that makes some of the most fun and funky accessories out there. So when I was presented with the opportunity to review some pieces from their new Japan-themed Nihon Journey collection, you can bet I was over the moon. 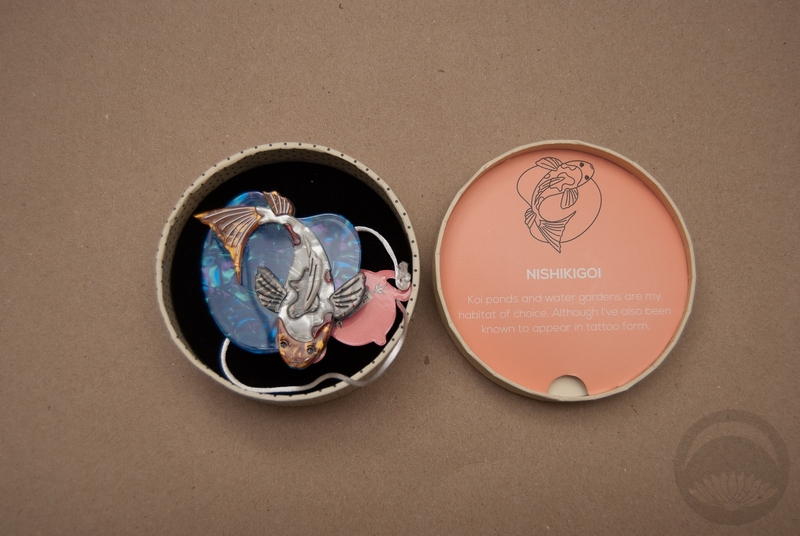 I selected three pieces; the Mysterious Maiko brooch, the Nishikigoi brooch, and the Noble Neko sweater chain/brooch. 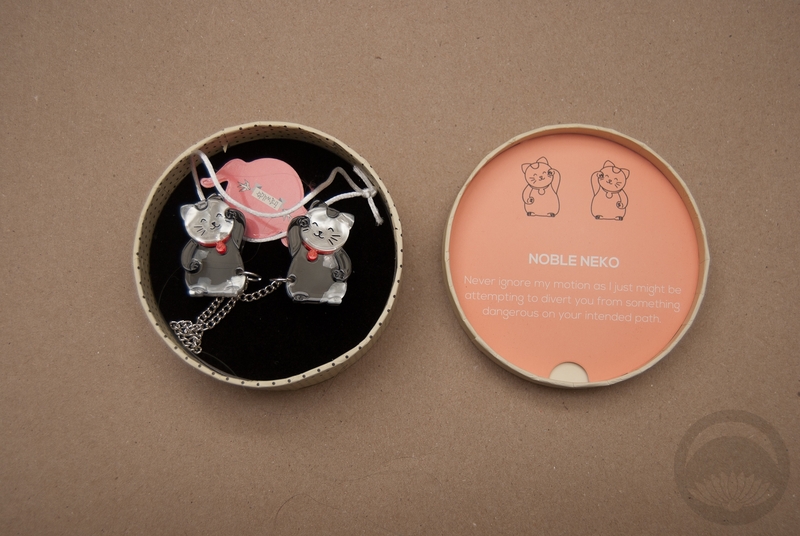 They arrived in beautiful boxes that serve as both protection and display, each one with a cute little card describing the design. The pieces are made out of layers of vivid, shimmering acrylic bonded together, and feel incredibly solid and secure without being bulky. 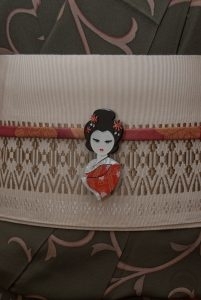 They’d make excellent gifts for both kimono collectors and non-collectors alike. 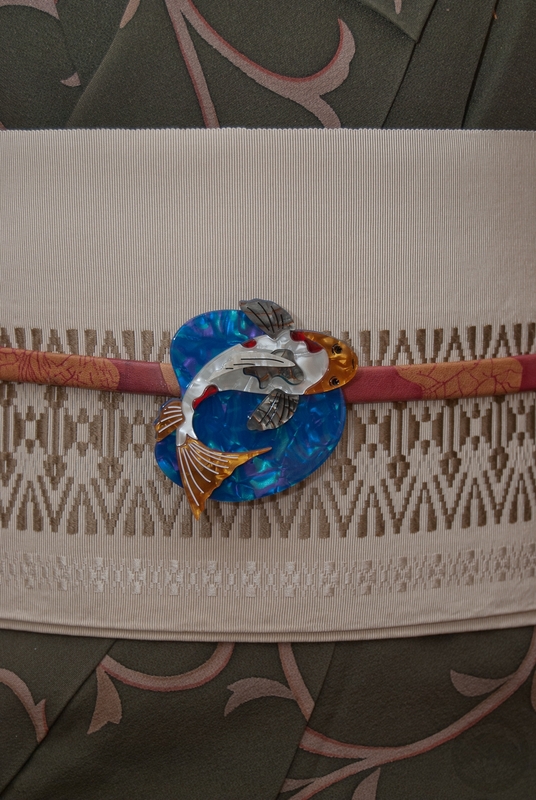 While these are all a fantastic way to inject a little Japanese flair into a non-kimono outfit, I thought they’d well and truly shine used as kitsuke accessories as well. The polymath of the Japanese tea-houses across the land. From serving to singing, dancing to dining. These girls do it all. 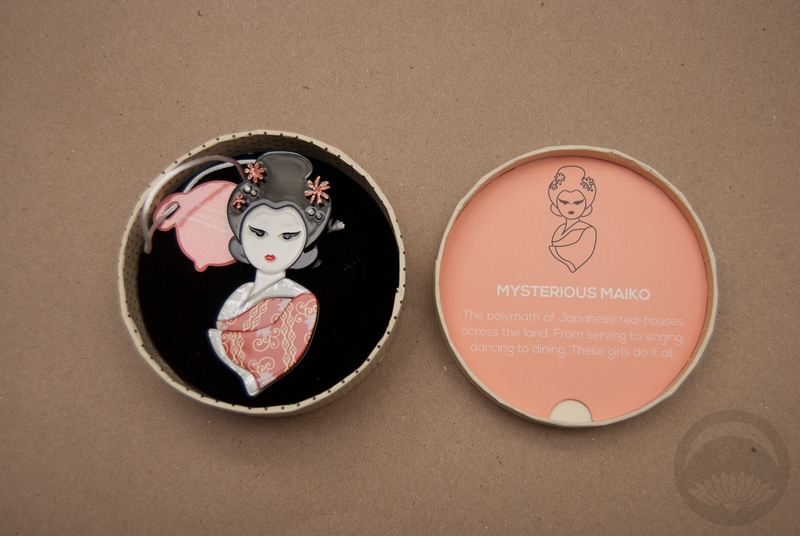 Mysterious Maiko is utterly lovely. She definitely has a hint of the vintage pin-up vibe Erstwilder does so well, but she’s still far more accurate than a lot of maiko and geiko imagery. It’s very clear that Carmen Hui, the designer of this collection, really loves and respects Japanese culture. The pieces are all quirky and unique, but still so undeniably Japanese in style and influence. 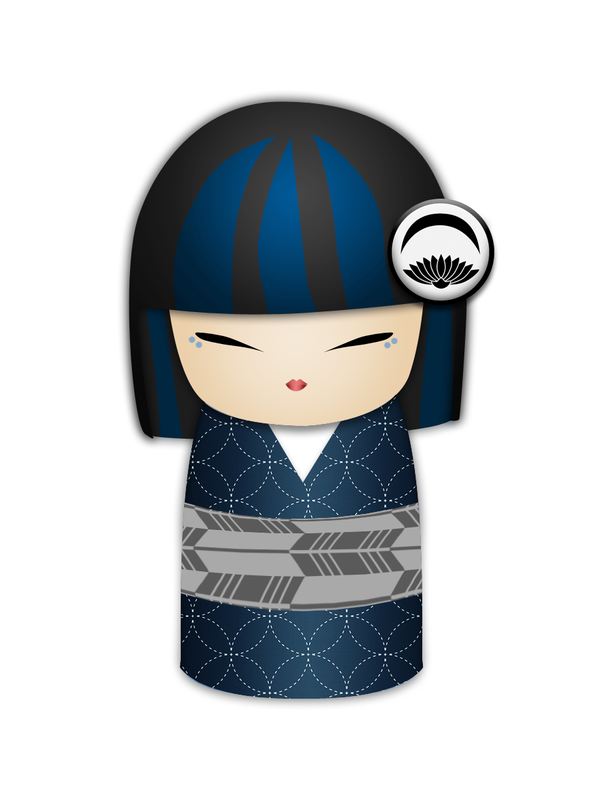 The pattern detail on her kimono is gorgeous – I’d love one like this for myself. Her hairstyle is simplified, but definitely has the overall shape and volume it should. Her face, despite being reduced to a few graphic black and red swatches, still conveys a sense of coy playfulness. Since the pin back on this one is vertical, I just slid it around the obijime and I think she looks very at home here! Koi ponds and water gardens are my habitat of choice. Although I’ve often been known to appear in tattoo form. Nishikigoi might be the stand-out for me. The colours used are so impossibly lush and deep and iridescent, and the photos I took barely do it justice. The water is rich and shimmery, the koi itself glows from within, and the blue and orange contrast each other perfectly. This brooch will need an obidome converter, unless you’re okay with the fishie being sideways. Honestly though, it works from all angles so if you don’t have access to a converter you could still make it work. I’m also absolutely going to be wearing this with western-style clothing too! from something dangerous on your intended path. Noble Neko is absolutely adorable! I actually requested this one because I was curious to see how a traditional sweater chain would work as a haori-himo, and look how perfect it is! 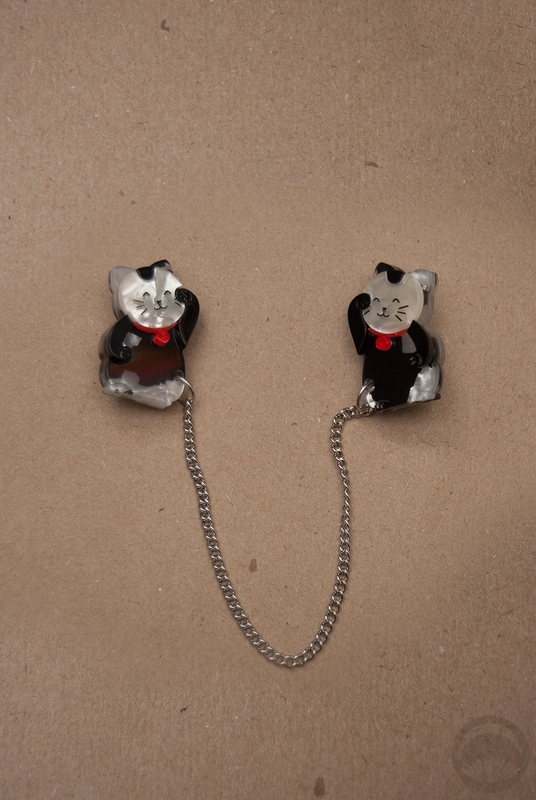 The two maneki neko are mirrored, which I think brings a lovely balance to the whole piece. 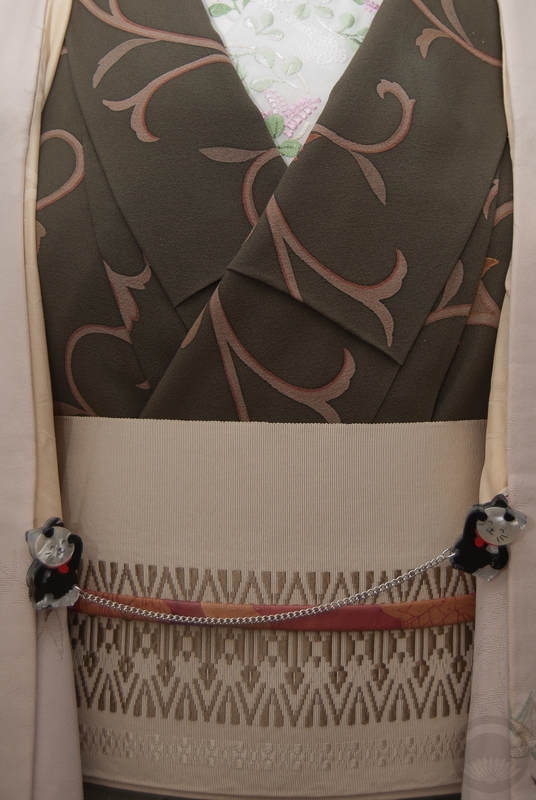 Using it to hold your haori shut is the easiest thing, you can just slide the vertical pin backs through the loops on the haori, so there’s no chance of permanent damage. I honestly find it easier to do and undo than a traditional haori-himo or a chain-style himo. The neko are also small and subtle enough that they would work with a slightly more traditional outfit, while still injecting a bit of cuteness. All in all, I am very impressed with this collection. The pieces are so well-made, and it’s clear this theme was designed with love and respect and just the right amount of whimsy. Far too often lately have we seen “Japanese” themed things released quickly and with no forethought, clearly designed to take advantage of a culture and aesthetic that’s not well-understood. That is absolutely not the case with Erstwilder. 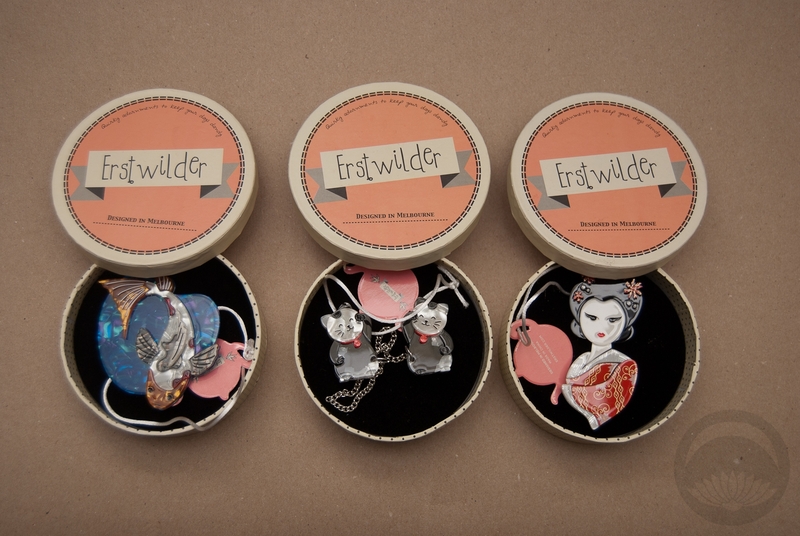 I am seriously debating adding a few more pieces from this collection as well as some from their other collections to my own stash! If you’d like one of these for yourself (and I highly recommend them), the Nihon Journey collection is on sale as of today. I received this item from the retailer or manufacturer for honest review purposes.If you have a topically appropriate craft, product, or service you would like me to review, please contact me. This adorable obidome was one of the awesome things in the last box of goodies Kansai_gal sent me. I love chidori, but I also love the amusing multi-faceted aspect of this particular piece. Chidori is the Japanese term for plover (a type of small wading bird), and when it comes to kimono the term generally refers to depictions of this bird. 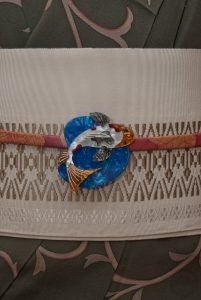 The depictions can be realistic, or very stylised, much like the depiction of the silver bird on this particular piece. 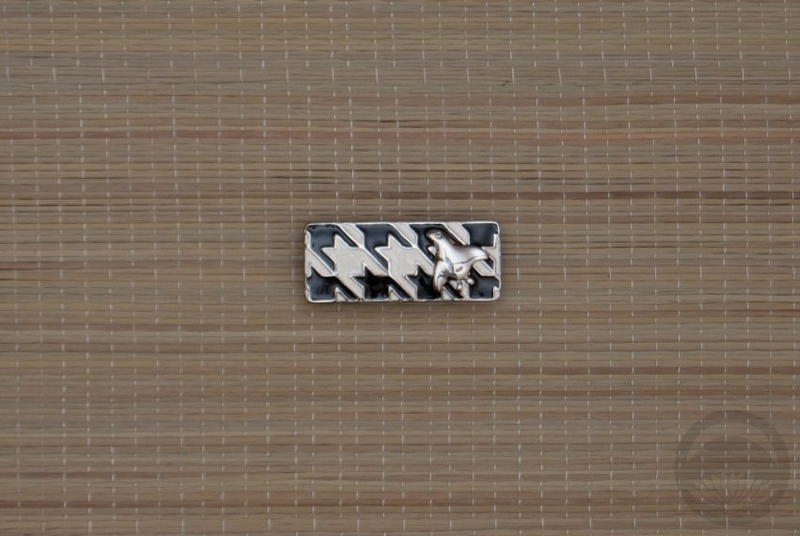 However, due to the similarity in appearance, the Japanese name for the houndstooth pattern on the background is also referred to as chidori. So this particular piece is technically chidori-on-chidori! Isn’t that cute? As I mentioned in the geta entry, I am a sucker for card motifs. When Mariko-san from Chidoriya World let me know that these obidome had come in, I knew I had to have one! At the time they were not able to accept PayPal, but Mariko-san was really helpful and understanding, so we managed to work things out with poor Naomi working as the middleman. She also included a lovely complimentary packet of Chidoriya World’s own oil-absorbing blotting papers, which was very sweet. I suffer from an unfortunately oily T-zone and so far they are working very well. I am trying not to use them too often though. The obidome itself is lovely, it’s a nice substantial size and made of a really shiny black material. It’s got a really fun funky feel. I’m looking forward to wearing it soon, I just need to find an appropriately spunky outfit to showcase it properly. 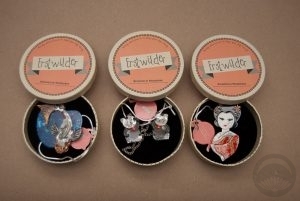 Recently, I seem to have amassed a large number of obidome and brooches specifically for my obidome converter. The two real obidome come to me courtesy of Kansai_gal, who picked them up for me in Kyoto. The first one is probably the most special, she found it and got it for me without telling me, and there’s a bit of a convoluted story behind it. Moonblossom is not only my domain name, it’s the handle I use on nearly every web forum/chat medium I’m on, and it’s a name I strongly identify with. I even have a tattoo of a Japanese-style family crest on my spine that is comprised of a moon and a stylized chrysanthemum. I have been collecting items with this design for a while now. Kansai found this and bought it for me, because it looks so much like a stylized version of my design. I was so touched, I can’t even begin to explain. I actually wore this out on the weekend. It came bundled with an adorable flat obijime that I haven’t had the chance to photograph yet, but I will soon! This is another one Kansai found while out shopping, and she knows me so well she contacted me right away. Aside from my strange fascinations with kimono and nail polish, I’m also a huge sucker for cars – primarily classic/vintage muscle cars, but also certain classic British cars. She found this obidome and knew how much I would want it. It reminds me (as well as my father and my best friend who are both big car geeks) of a mid sixties E-Type Jag, which is one of my dream cars. I’m not sure if it was intentional, but I’m going to tell myself it was. It’s got a very interesting texture, it’s made of carved buffalo horn so it’s sort of translucent and glassy but very durable. I love it, and can’t wait to wear it! I found this from the same antique seller as the previous brooch, and it had no price tag. She told me I could have it for five dollars, and I jumped on it. I love the art deco feel of the piece as well as the tiny flecks of marcasite in the leaves. 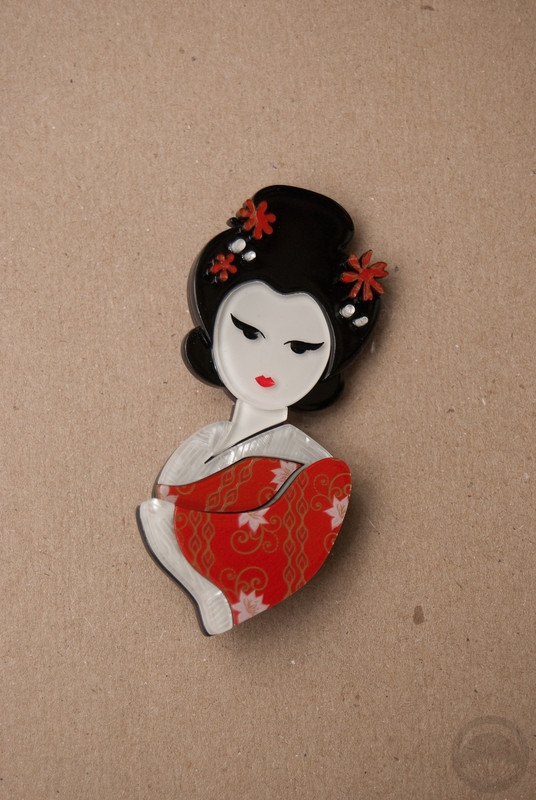 I am considering replacing the milk glass with pearls at some point, since they are a bit dull now, but I still think it’s a beautiful vintage brooch and I definitely plan to wear it both with kimono and regular western clothing. Yes, you read that right. This is actually a ring. It’s got an interesting stretchy metal band that fits perfectly over both round and flat obijime, so I think it will be really versatile. I love the little rhinestone in the middle. Obidome converter, just about the best invention ever. Earlier this week, Erica sent me a box full of awesome goodies, and tucked inside was this epic doohickey. I’ve wanted one for quite a while, so I was really thrilled. Obidome are pieces of jewelry meant to be worn on the obijime. I have several, but they’re the kind of thing that are always nice to have more of – they add a wonderful finishing touch to an outfit. Unfortunately, they don’t often show up on the secondary Western market, and when they do the prices can get prohibitively expensive. Enter the magical obidome converter. It’s basically a very thin piece of tubing with obidome hardware (two flat metal loops) attached to the back. 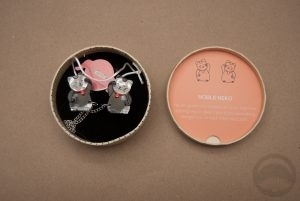 You insert the pin part of any brooch or button through the tube, and voila, instant obidome! 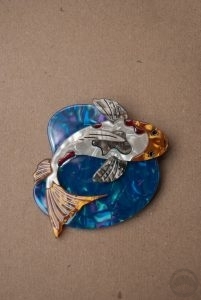 And here it is on a brooch. Rather than hunting eBay and garage sales and thrift stores and hoping I may luck out and find an obidome, now I can just use all the old costume jewelry and pins I already have lying around. Yay!